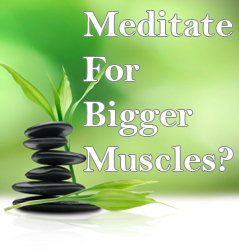 Can Meditation Make Your Muscles Bigger? 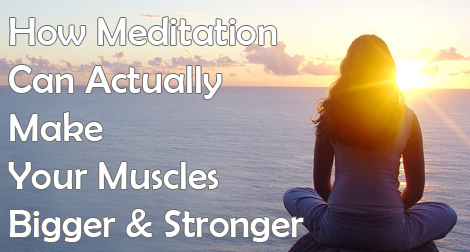 Can daily meditation give you bigger muscles? Something you may not know about me is that I meditate on a daily basis. Or in modern terminology, I practise mindfulness every day. Sometimes just as little as 5 minutes if I’m pressed for time. What you also didn’t know (actually I didn’t know, either) is that meditation may actually increase and accelerate your muscle gains. For studies to prove all of the above, see here. But it can also promote better and quicker muscle gains…according to a new study. There are catabolic (break-down) hormones and there are anabolic (build-up) hormones. While both are actually necessary for muscle growth, chronic or continuously high levels of catabolic hormones will hinder your gains. So we would like our hormonal environment to be as anabolic as possible. Anything that helps bring this about is obviously going to help with our efforts in the gym. In this study  researchers wanted to know if meditation would decrease the level of catabolic hormones and raise the levels of anabolic hormones in test subjects. Volunteers were aged 18 – 34. Half of the group meditated for 4 months, while the other half did relaxation exercises. Testosterone levels were not negatively affected by the stress test. In the other group, testosterone levels decreased when subjected to the stress test. …meditation reduces continuous stress, and as a result the body reacts better to stress stimuli of short duration. NOTE: I recently wrote about a diet that maximizes your anabolic hormone profile here. Don’t miss it. Also, my cutting/fat loss program Total Six Pack Abs is designed to optimize your anabolic hormones – even while you’re stripping fat. No wonder my clients keep gaining in the gym while torching fat. Losing muscle while getting ripped is a thing of the past. Do you meditate? Let me know below. How has it affected your life? Would you like to get started with a mindfulness practice? The best thing I can recommend you do is download the free Headspace app for Android or iPhone. The first 10 days of 10-minute meditations is free, allowing you to see if it is beneficial for you. So in short, stress heads build less muscle. And if you’re serious about building muscle the most effective way possible, download my free Targeted Hypertrophy Training program below and start making quick gains (if the download form isn’t displaying, please go to the very top of this page to enter your email and click the download button). P.S. On my facebook page today, I let my followers know that there is 25% off whey at MyProtein right now. Reference:  Effects of the Transcendental Meditation program on adaptive mechanisms: changes in hormone levels and responses to stress after 4 months of practice. Psychoneuroendocrinology. 1997 May;22(4):277-95. Been doing mindfulness for over a year now. It has been actually quite long-changing for me. Great post Mark. I have found that meditation is something that is hard to master, but when you get into the “zone”, it is very powerful. And I also have the headspace app on my phone. It’s a great way to learn the basics of meditating. I’ve been meditating for the last year and its changed me in every area of my life. But I also had an advantage by using a safe, effective audio technology made for perfect meditation everytime called “Brain Entrainment”. I’ve been meditating for a few years now and it has helped tremendously with my reactions to stressful events and has help me remain calm and centered most of the time. Hi MARK, i am a fan in taiwan. I have utilized your technique and made great gains. I am hoping you can teach a HIIT TECHNIQUE OF YOUR EXPERTISE! I am a believer in your bodybuilding world. Thanks. I apologize for the question asked in this topic of meditation.